Catch an eye full of this psychedelic treasure! 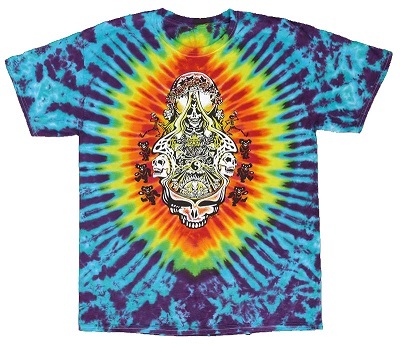 This double skull Grateful Dead tie dye t-shirt is almost like a tripped out eye-spy. Do you see Jerry there in the middle? Be sure to snag one for you or your favorite Dead Head today! The graphics pop on the bold tie dye colors used to highlight the amazing details of the GD art!